This raw video captured by News 5 photographer Andy Garcia shows police at the scene of Gas USA after a car theft and shooting incident Sunday. 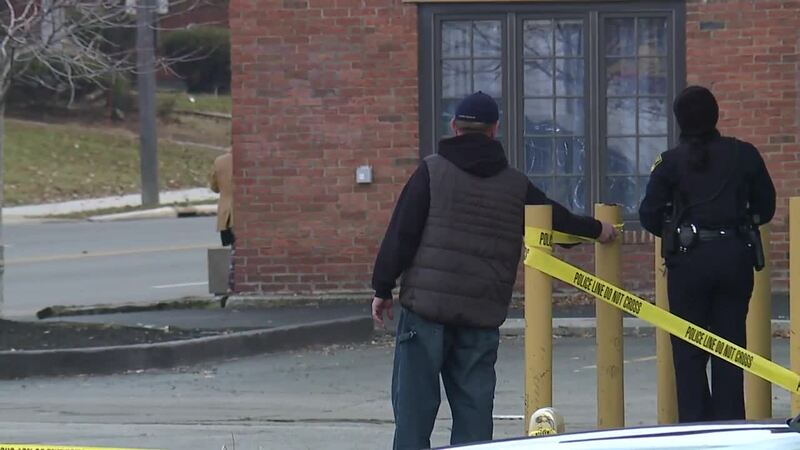 CLEVELAND HEIGHTS, Ohio — A teenager was shot at after he jumped into another man’s car at a Cleveland Heights gas station Sunday, according to police. The report says he then drove off and crashed into two other vehicles. The teen is in the hospital in serious condition, and three other people were detained by officers. At about 1:12 p.m. Sunday, Cleveland Heights police received calls reporting shot fired at the Gas USA on Noble Road, according to a news release from police. Callers also reported a three-car accident at Monticello Boulevard and Englewood Road just after the shots were fired. The preliminary investigation indicates that a gray Ford Fiesta pulled into the parking lot of the Gas USA and the driver, a 32-year-old man, left the vehicle running when he entered the store. While the driver was inside, a 17-year-old male exited a vehicle that was parked at the gas pumps, and got into the driver’s seat of the Fiesta. The driver of the Fiesta then left the store, approached his car and pulled a handgun from his waistband, police said. The driver pointed the gun at the teenager, and the teen started to drive away with the Fiesta. The driver then fired three shots into the vehicle. The teen drove out of the parking lot onto Noble Road and struck a vehicle traveling north. The teen continued driving east onto Monticello Blvd., and as he attempted to turn north onto Englewood Rd., he struck another vehicle, according to police. After the accidents, three men who were with the teen before he the stole the Fiesta drove to the scene of the accident, pulled the teen from the Fiesta, and drove him to an area hospital, according to police. An adult male and a juvenile male in that vehicle were detained by officers at the hospital. The teen who allegedly stole the vehicle is reported to be in serious condition. Later that night, the 32-year-old man who was driving the Fiesta before it was stolen surrendered to police and is in custody at the Cleveland Heights Police Department, police said. The juvenile detained at the hospital is facing criminal charges and is in custody at Cuyahoga County Juvenile Detention Center. No charges have been filed against either of the adults in custody at this time, and the investigation is ongoing, police said.